My creations are mainly made with acrylic paint and sometimes brightened up with various collage techniques. My creations combine different tools, techniques and materials to paint on, which I invite you to discover. First of all, I never place my material on an easel. I lay it flat as I personally need to have it horizontally to draw, paint and when I use a collage technique. It can sound strange but I need my wrist to rest on the material to draw and paint. - Pencil drawing with marker pens and art felt tip pens. - Mixed technique which, as the name suggests, uses at least two distinct mediums. For my part, I often mix acrylic paint with art felt tip pens, and sometimes adding to the work various collage techniques using objects, pictures, cuttings or materials (e.g. wood, metal, cloth, newspaper, glazed paper, crepe paper, plastic, foodstuff...). As soon as I find an object, a piece of material or a picture I like, I put it aside in my lucky find box. I use flat brushes (synthetic or hog hair) of different sizes or a small paintroller to paint solid-coloured backgrounds, to create shadows or to apply on large and dense areas. 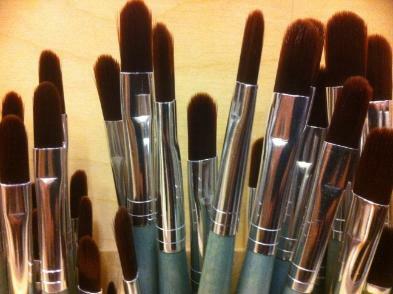 I use round brushes (squirrel or sable fur) for fine details, precise work and for the finish. I sometimes even use my own fingers to paint! - White drawing paper, with soften grain, 125 to 200gsm. - Medium grain cotton or linen canvas tightened on a wooden frame with splits and nailed on each side. Linen, with its inimitable appearance, is well known for being strong, long lasting and for keeping its shape. Canvas is the format I use the most. - Depending on the subject of my work, I use different formats of material, ranging from 18x24cm to 150x150cm. I sometimes even use larger ones. - Graphite mine pencil. It is really simple to use and it's ideal to draw an artwork's main lines or to make basic sketches with or without relief. I usually use it to draw a general layout or to sketch before applying the paint on the canvas. - Posca markers and art felt tip pens. Offering a variety of tips, they are used for fine details, meticulous work, and sometimes for the finish. They provide the advantage of quick drying and, depending on the colours, the paint may be opaque enough to cover large areas. The paint is also light resistant and permanent. - Gouache. Fluid and opaque, it is similar to watercolour paint but thicker. Its smooth paste is rich in pigments and is mixed with water. 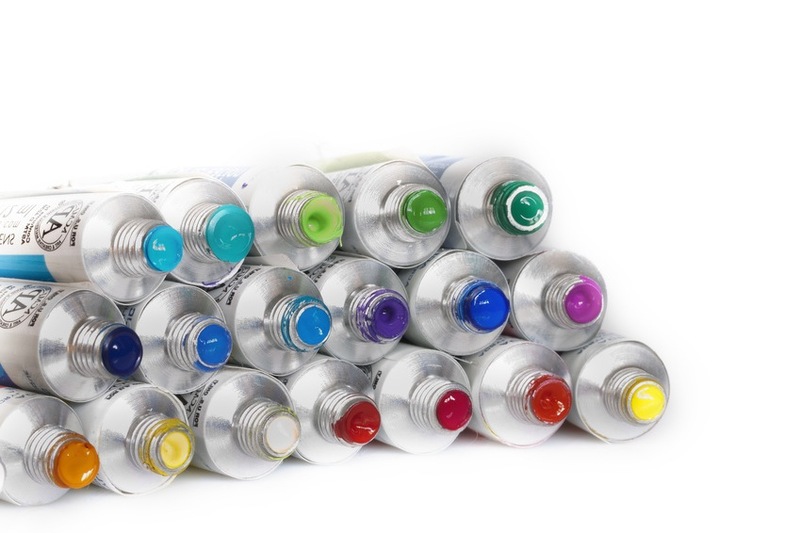 Gouache is appreciated for its easy to use and easy to clean characteristics. The paint gives a matt finish and a special varnish can be applied over it. I like to use this medium as it gives a thin and transparent finish like watercolour paint does, but it can also give a darker and matt finish like oil paint does. - Acrylic paint. Invented in the United States in the early twentieth century, it is made of a binding agent (usually polymeric resin) and mineral or organic pigments which offer light resistance and quick drying. Being systematically compared to oil paint, which more consideration was given to, the acrylic paint has acquired its noble reputation thanks to Andy Warhol. 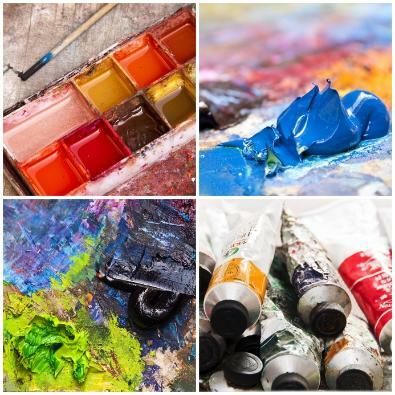 All colours of acrylic paint can be mixed together and are water miscible. Sand or pigments can be added to create relief effects. This odourless paint, thicker than gouache paint, is permanent and gives a homogeneous appearance with a satin finish. A varnish can be applied over it. I like this type of paint as it is fluid, it can be mixed easily to create nuances of tones and it can be applied to any type of material, it dries quite quickly and is easy to clean which I think makes it quite ideal!